We carry a wide selection of candles from Coventry Creations. Coventry Creations is a small, local company in Michigan, and has a strong focus on quality. The selection that we carry does change from month to month as we work on pairing the candles we carry to what is going on in the world around us, for example in February we carry a lot of love styled candles, and October Ghost and Clearing candles. 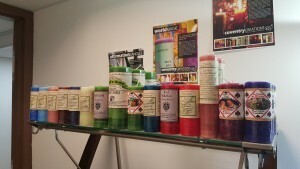 We almost always have Prosperity style candles in from each of the lines all year round.